“In a September 24 meeting with Defense Secretary Gotabhaya Rajapaksa on the margins of the UN General Assembly, SCA A/S Robert Blake stressed the urgent importance of resettling as many internally displaced persons (IDPs) as possible and providing them freedom of movement, and the urgency of beginning a political reconciliation process with the Tamil community, if we are to make progress in strengthening U.S.-Sri Lanka relations. Key to reconciliation is identifying an accountability process to help address past human rights abuses and potential violations of international law that may have transpired during the final stages of the military conflict with the Tamil Tigers (LTTE), Blake pressed.” US State Department wrote to US Embassy Colombo. 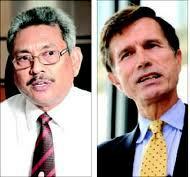 A classified diplomatic cable which details a meeting the US Assistant Secretary for South and Central Asian Affairs Robert Blake has had with Secretary to the Ministry of Difence Gotabhaya Rajapaksa on September 24, 2009. The Colombo Telegraph found the related US diplomatic cable from the Secretary of State section of the WikiLeaks database. The cable was classified as “Confidential” signed by Hillary Clinton on September 25 2009. “Rajapaksa underlined his personal commitment to strengthening relations with the U.S. He said the Government of Sri Lanka (GSL) is committed to resettling as many IDPs to their villages as quickly as possible, arguing that it is in the government’s political and security interests to do so, but the process is slowed by a lack of funding and demining equipment, inadequate infrastructure and housing in conflict-affected areas, and the continued presence of LTTE in the IDP camps. He maintained that people can leave the camps and regretted the perception that they are detained. He argued that people in the camps have nowhere else to go and have chosen to stay. He pointed to the Eastern Province as an example of a successful resettlement effort which, he stressed, took up to nine months. It has only been three months since the end of war, he emphasized. He sought to assure Blake of President Rajapaksa’s commitment to political reconciliation, but argued that the President needed to be cautious of political opponents who will seek to portray him as selling out the nation after the Army’s sacrifice and hard-won victory. Accountability ‘commissions’ at this stage, he told Blake, would tear the country apart, rather than promote reconciliation.” the US State Department further wrote. United States with its horrendous human rights record, it’s neo colonist adventurism , cannot lecture Sri Lanka on accountability, period. Hypocrisy by the US does not justify brutal behaviour by a benighted Asian backwater. What are you going to say next? That genocide here is okay because Hitler did it first? Come off it buddy, because you know exactly what I am saying and you are DODGING THE QUESTION. But then, what is new for yet another Rajapaksa apologist! Gotabaya could be easily named ans THE symbol of diplomatic disaster. It would better for sri lanka if does not yap! Mum is the word Sri. Gotabaya Rajapakse’s response is excellent and it is hoped USA would understand the ground reality that the IDPs have no where to go as there homes are not habitable and the terrain is yet to be demined. On the same token, how is US trying to pretend that it is the protector of human rights, when its record is appaling, even though its client NGOs like the HRW and AI are silent on US crimes. I understand Russia has finally stepped in to bridge this gap by preparing an annual report to its parliament on US human rights violations. You better stop uttering “terminological inexactitudes(TIs)” because HRW, AI, ICG and other reputable human rights organizations HAVE taken the US (and their ally, Israel) to task times without number. You know, this isn’t a website controlled by your friends in the Sri Lankan government and uttering TIs won’t work as it probably does in the Daily Noise!